The chromatography resins market is expected to record a moderate CAGR during the forecast period (2018-2023). North America holds the highest market share on account of its pharmaceutical and biotechnology industries where as Asia-Pacific is expected to witness the highest growth rate. The demand for chromatography resins in the field of monoclonal antibody production is expected to grow at a considerable rate, owing to a rise in the number of critical diseases across the world. 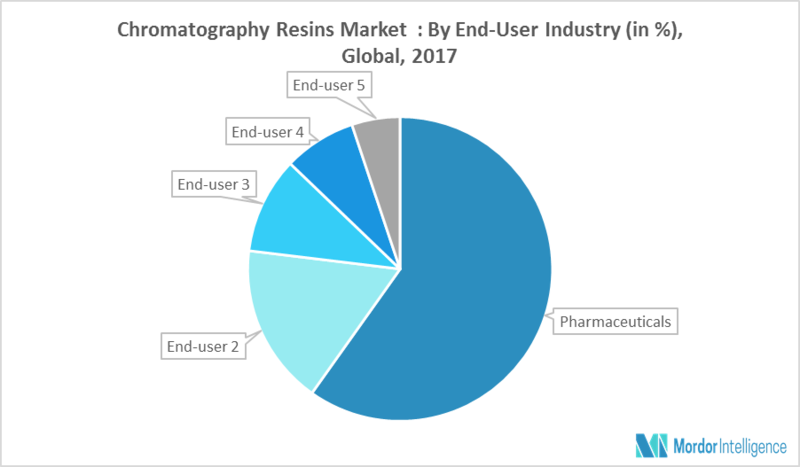 The increasing academic and commercial R&D spending on pharmaceuticals is the main driver for the chromatography resins market. Chromatography resins are used for a wide variety of applications, such as the separation of chemical and biomolecules, for drug delivery, protein purification, and diagnostics. Affinity chromatography resins are used abundantly in genomics, proteomics, and metabolomics. Affinity chromatography resins are used in protein-protein interactions, post translational modifications, and protein degradation. The coupling of reversed phase affinity chromatography with a mass spectrometry has ultimately aided in the discovery of protein biomarkers. Bio-based chromatography resins, such as agarose, dextran, and others are used extensively in immunoglobin and protein purification. Agarose accounts for the largest share of the applications in affinity chromatography resins. Affinity chromatography resins are often chosen to purify biomolecules due to their excellent specificity, ease of operation, yield and throughput. North America holds the highest market share on account of its pharmaceutical and biotechnology industries. The presence of a large pool of manufacturers, as well as vendors of chromatography resins, in North America, is the key factor behind the growth of the regional market. The United States accounts for the highest market share in the chromatographic resins market. It is also expected to grow considerably during the forecast period, driven mainly by growing demand in pharmaceutical and biotechnology applications. November 2017: GE Healthcare acquired Puridify, and has decided to invest in the FibroSelect technology developed by Puridify, which will help to overcome limitations observed with packed bed chromatography purification. Major Players: Thermo Fisher Scientific Inc., GE Healthcare Life Sciences, Merck KGaA, and Mitsubishi Chemical Corporation, among others. 8.3 Avantor Performance Materials, Inc.
8.13 Thermo Fisher Scientific, Inc.